Trying to counter a pro-Assad offensive threatening to cut off Aleppo, Syria’s rebels attacked regime positions within the city on Monday. Pro-rebel outlets said the Fatah Halab operations room activated sleeper cells, including the underground bombing of a military headquarters and the infiltration through a tunnel of the ancient Aleppo Citadel. Rebels said dozens of troops were killed in the bombing, a claim that could not be confirmed. They added that more men were slain as they slept in their beds in the Citadel, with one of seven attackers killed. The attacks sought to relieve pressure on the front near the al-Castello Road, north of Aleppo, where the Syrian military and allied foreign militia made a significant advance last week. The pro-Assad forces have closed to within 1.5 km (1 mile) of the road, establishing “fire control” to threaten any traffic. A rebel counter-attack on Saturday briefly occupied a hill overlooking al-Castello, but fighters soon withdrew under heavy artillery fire. Aleppo city, Syria’s largest, has been divided since July 2012. Activists claim up to 300,000 people will be threatened in the opposition-held areas if the al-Castello Road is cut. The Iranian site Tasnim has acknowledged that Hezbollah is training “hundreds” of the Iran-recruited Afghan fighters in Syria. The side claimed that there were hundreds of Fatemiyoun Brigade “snipers” alone, as Iranian media testify to the escalation of Iranian and Iranian-organized forces supporting the Assad regime and Syrian military. The Afghans have been brought into Syria by the Iranian military since 2012. They are recruited with a combination of appeal to religious duty, incentives of money and long-term residency in Iran, and threats of deportation and pressure on their families. Once in Syria, the fighters often serve as “cannon fodder” for Iranian-led attacks on rebel positions. In a bizarre juxtaposition with its air and ground attacks across Syria — including claims of victory both in the northwest and in the south near Damascus (see below), the Syrian Army said on Monday that it is extending last Wednesday’s “ceasefire” by another 72 hours. The supposed truce will last until 11:59 p.m. on Thursday. The Syrian military announced the initial “ceasefire” last week. Meanwhile, accompanied by foreign militias and enabled by Russian airstrikes, it pursued an important offensive north of Aleppo to cut off the last route into opposition-held parts of the city. The army has also advanced in East Ghouta near Damascus, and failed to take ground in assaults in Latakia and Hama Provinces. Airstrikes across northwest Syria have killed scores of civilians. The Syrian military has claimed another advance in the East Ghouta near Damascus, saying that it has established control over the town of Maydaa. Continuing an offensive that has taken much of the area in recent months, the Syrian army and militia began the assault on Maydaa last week. A military source told State news agency SANA that remaining opposition had been cleared from the town on Monday. The army says that the advance will cut off an important supply route from the desert to the northeast of Damascus. The pro-opposition Orient News said that more than 2,500 families have fled to the town of Douma, abandoning farmland and wheat fields. The regime advance, which has taken almost all of the southern part of East Ghouta, has been aided by weakened defenses because of rebel in-fighting. President Assad has sworn in the new Cabinet under Prime Minister Imad Khamis, telling them that they must make “exceptional efforts” amid “the difficult circumstances currently taking place in Syria”. Preserving the value of the Syrian Pound, bolstering state resources via calculated importation, encouraging exportation, encouraging medium and small industries and agricultural industries, achieving justice in tax collection between the public and private sectors, monitoring and rationalizing expenditures starting with ministers and officials, [and] rationalizing subsidies for essential materials by ensuring they reach beneficiaries”. Amid estimated losses of $275 billion in Syria’s conflict up to the end of 2015, GDP has fallen about 15% per year. The Local Coordination Committees documented the deaths of 98 people, including 22 children and eight women, across Syria on Monday. Of the deaths, 70 were in Aleppo Province, amid Russia airstrikes on opposition-held parts of Aleppo city. 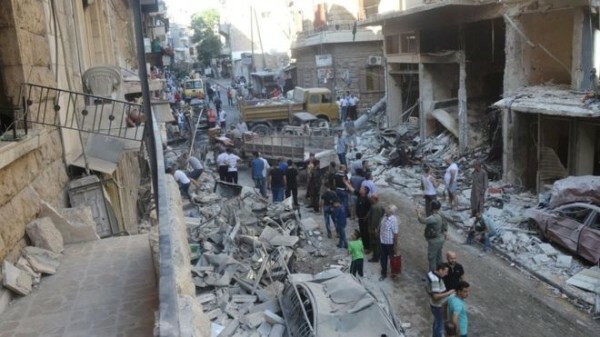 Another 11 people were killed in attacks on a fuel market in Idlib Province. Amid reports that Turkey will soon offer up to 300,000 Syrian refugees citizenship, Deputy Prime Minister Numan Kurtulmuş responded to criticism on Monday by emphasizing that only qualified and educated Syrians “with a clean record” can become Turkish nationals. “Studies are being conducted on how those Syrians who can be of benefit Turkey, who have never been involved in acts of terror, and who could serve as a bridge between Turkey and Syria, could become Turkish citizens,” Kurtulmuş said at a press conference. Turkish media reported last weekend that the Government plans to bypass the normal 5-year waiting period for up to 300,000 of more than 2.7 million Syrian refugees. They said that 30,000 could soon be given the opportunity, with the ability to vote in elections in a year. Opposition parties have challenged the proposal, saying that President Recep Tayyip Erdoğan is trying to obtain voters for the ruling Justice and Development Party (AKP) and for discriminating among refugees. Kurtulmus said the details of the scheme are yet to be fully worked out by the Interior Ministry.